Saenz said that there is a collapse detection system on the causeway with fiber optics all around. If there would be some structural damage the system would notify officials immediately. 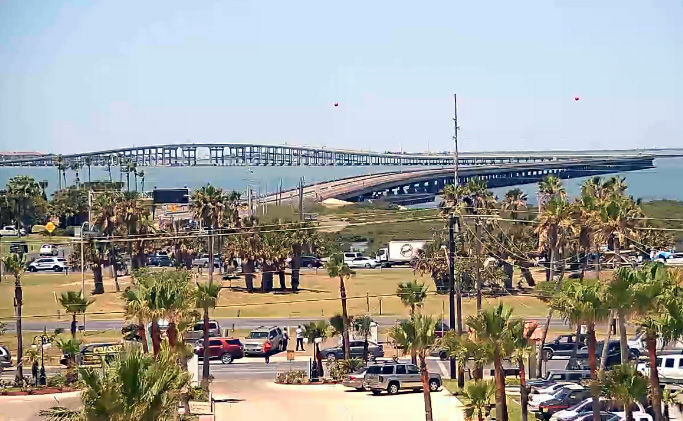 The website southpadrelive.com, which shows live camera feeds of the causeway and other areas of South Padre, shows a bridge void of traffic on either side. The live video camera from sopadre.com shows traffic stalled on Padre Boulevard and periodically it is being diverted at the turnaround at the base of the bridge. A South Padre Island official says the threat came into the Port Isabel Police Department. He called it a potential damaging event to the causeway According to one report, the phone call came from a Harlingen number and the caller indicated that the causeway could collapse. Port Isabel Police, the U.S. Coast Guard and the Department of Public Safety assisted in inspecting the bridge. “TXDOT has done the first search. The U.S. Coast Guard is going to do its search. Cameron County is going to have its drone go over ahead,” said Port Isabel Fire Marshal John Sandoval. All traffic was moved off the Causeway and both east and westbound lanes were shutdown shortly after the call was received. Hundreds of motorists were stuck in traffic. “Just bear with us. We take every concern and every threat very seriously and this is only for the safety and well being of the general public,” Sandoval said. “We stress that there is no indication of visual or structural damage and that the collapse detection system (a fiber optic system that activates through the use of sensors of any offset in integrity) has not alerted of any issues,” TxDot reported in a news release. “Nevertheless, because safety is our main mandate, we are doing our due diligence and working in conjunction with the Texas Department of Public Safety and the U.S. Coast Guard to ensure the safety of the driving public. We estimate that the bridge could reopen within an hour.